This Bavarian dessert is a recipe from Kienow's Bakery in Portland Oregon, moist layers of sliced bananas and whipping cream. You can chose to make it in 9-in pans or in a sheet pan cutting into 3-inch plus strips and layering it as I have done in my photo. 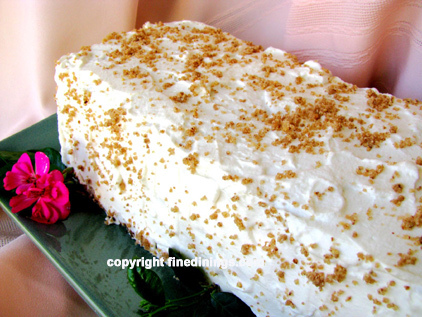 This is a great dessert recipe to serve to large groups. See more of my Gourmet Desserts. Whip ingredients together to soft peaks. In a large mixing bowl blend together flour, sugar, baking powder, baking soda, salt, corn oil, mashed bananas, vanilla, buttermilk and egg yolks. Make the meringue in a separate bowl beat ingredients together to stiff peaks. Fold meringue into batter. (this method will make two loaf sized Bavarian cakes each 3 layers high (see picture above). Pour batter into a greased and floured 18-in x 11-in sheet pan. Bake at 350 degrees F. for 20 to 25 minutes. Remove from oven to cool on a rack. Cut in half horizontally to make two cakes 9-in x 11-in. Cut each into 3 equal strips making a total of six pieces 9-inches by approximately 3-2/3-inches. Use separate serving plates for each three layers or arrange both on a large platter. Place wax paper strips under the edge of each rounds so the plate will stay neat while applying the frosting. Place one cake round on a plate, spread with filling, then some fruit slices. Place the second round, spread with whipped filling then banana slices. Place the third round. Do the same for each. Frost top and sides with the remaining whipped filling, sprinkle with finely chopped pecans. Remove wax paper strips. Refrigerate until ready to serve. Pour batter into two greased and floured 9-inch round pans. Bake at 325 degrees F. for 30 minutes or until toothpick inserted in center comes out clean. Remove from oven to cool on a rack. Cut each in half horizontally to make a total of four layers. Place wax paper strips under the edge of the baked rounds so the plate will stay neat. Place one split layer on plate, spread with whipped filling, add a layer of banana slices. Add the second layer, do the same adding fruit slices to this layer. Add the third layer, spread with whipped filling and the remaining fruit slices. Top with the final layer and frost the top and sides with the remaining whipped filling; sprinkle with chopped pecans. Remove wax paper strips. Refrigerate until ready to serve.